for shooters of all ages! 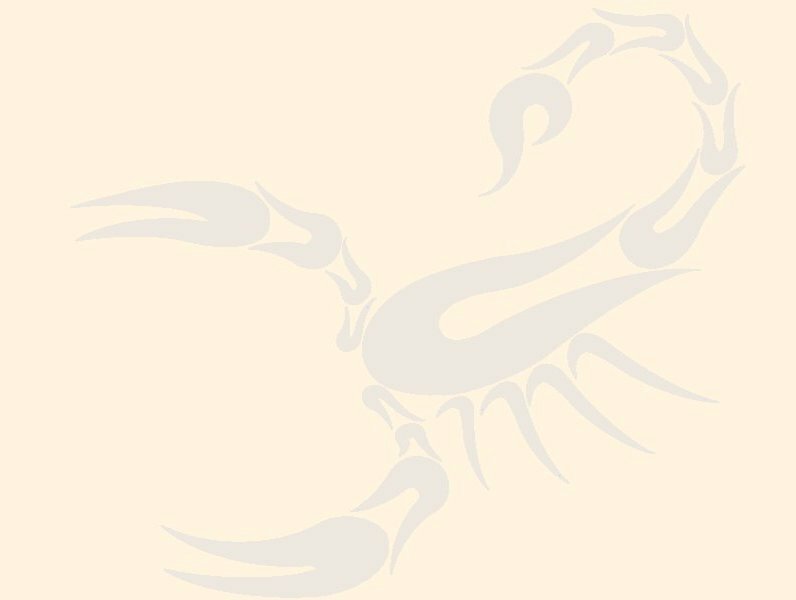 Closeouts & Cool Stuff! F.A.Q. On this page we offer some of the things you might like to have along with your new slingshot. So be sure and scroll down to see it all! Safety glasses I can actually use! 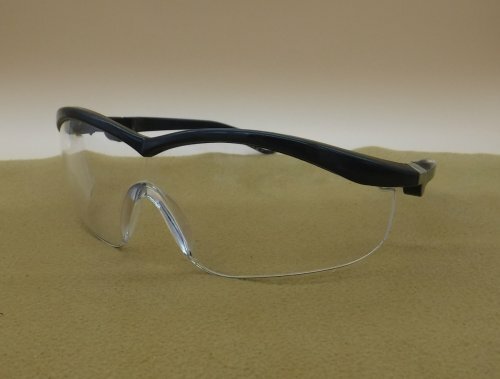 For the longest time, it has been extremely difficult for me to wear safety glasses AND shoot accurately... You see, pretty much every pair I've ever tried has a fairly large (huge for me) paralax error... and so I basically just don't wear them because of that! BUT NOW, I really don't have an excuse, other than laziness and apathy... because these glasses are so true to correct that I can wear them and completely forget about them... which I've done numerous times while working in the shop. So now, if I get a bad ricochet or a band snaps in some mysterious way that it hits me in the eye... then whatever happens because of that will be ALL my fault... and the same goes for YOU now as well! Competitive pricing, same with all of our products, we're not trying to gouge you when you buy ammo either! Probably like you, we're not in the packaging business either... and like you again, we want what's IN the box or package not the package itself. 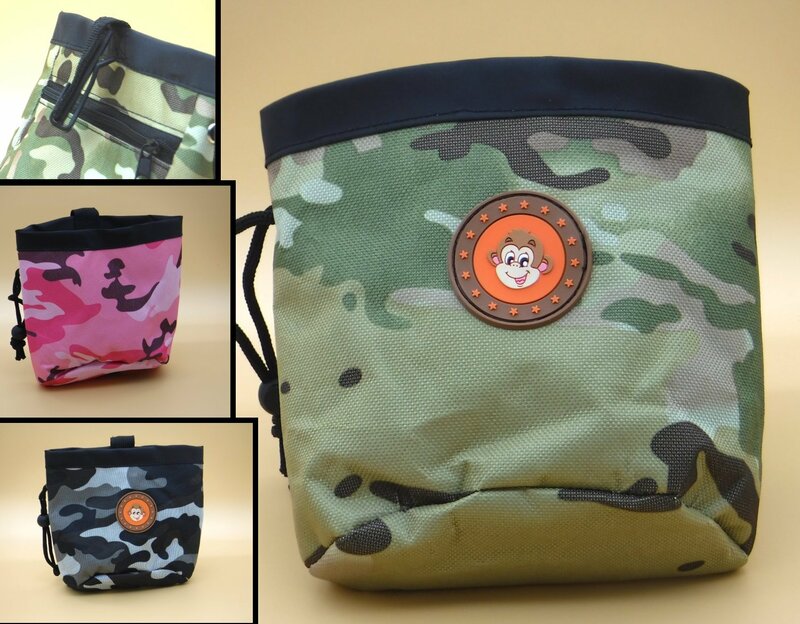 So instead of paying extra for expensive packaging, we put it in a reusable zip-lock bag and give you more actual product for less money! So, you could go to eBay, or any number of other places, and buy ammo for up to $9.95 per 100 rounds (sometimes even more), or you can get it here for a fraction of that... it's up to you! 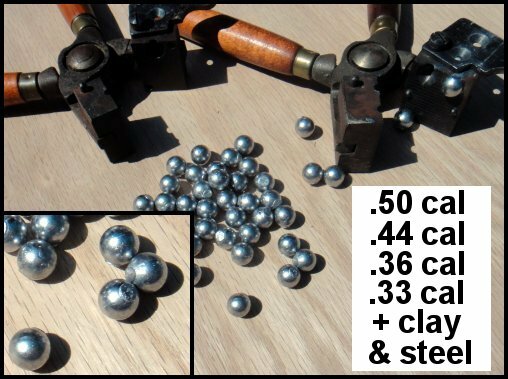 We offer different sizes and types of ammo, all the way from biodegradable clay balls, to .50 caliber heavy hunting ball in both lead and steel to the very popular .44 caliber lead ammo all the way down to 5/16"(8mm) steel balls. All lead ammo is suitable for target shooting or hunting. The larger the caliber the bigger the FPE potential and the bigger the potential game that can be taken. For example .44 caliber is good for squirrels and rabbits, and .33 caliber is good for sparrows to dove. All lead is of the highest quality and is suitable for use in muzzle loading as well. Each time you click the "Add to Cart" button it will open with your selections in a new paypal window or tab... to continue shopping, close the window/tab and continue selecting! 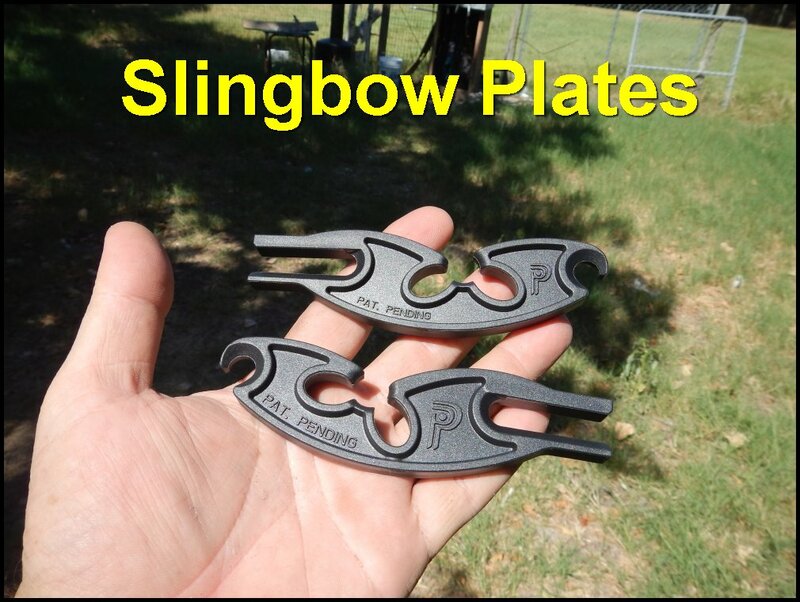 You may already own one of the most accurate slingshots ever made... all you need to do is attach the right bands! You see, the old "bomb proof" metal rod frames are fine, it's the big obnoxious hard to shoot tubes and pouch that are the problem, that's what makes them so hard to shoot accurately and therefore obsolete for good shooters.... So we came up with the PERFECT solution for that! In keeping with the whole slingshot philosphy of K.I.S.S. (Keep It Simple Stupid)... we are proud to introduce the EASIEST, FASTEST, MOST SECURE, and just all around BEST way to attach flat bands, single tubes, looped tubes and rubber bands to a "big box" mass produced metal rod slingshot! 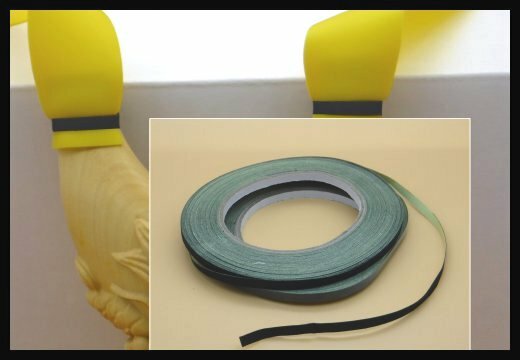 All you have to do is push the elastic tube, flat, or band through the clamp hole, slide the loaded clamp (elastic on opposite side of the rod from the set screw) onto the slingshot's rod and then tighten it down with the included hex key. Forward, backward, over the top, through the forks... just about any kind of elastic, in any kind of shooting presentation... they all work with this setup! Predator Smart Clamps allow you to turn that old slingshot that you never use, into something that can shoot with the best of the best in modern design! 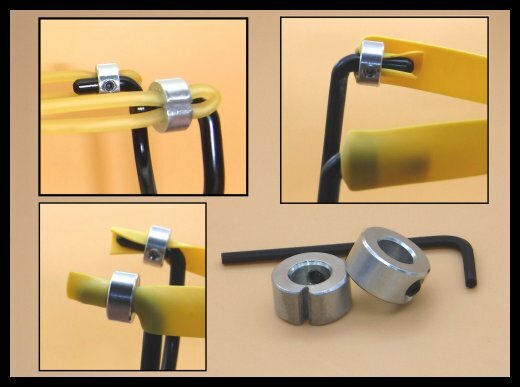 When you buy with the wrist brace slingshot and if you request it, we'll take off the tubes that come with the slingshot and install the flat bandset, that comes with the clamps for your convenience (tubeset will be in the mailer box). The Predator Smart Clamps can also be used with the old original Weber Slingbows or with any NEW design that YOU may come up with that simply has a 1/4" rod as the fork tip... Just think of the possibilities! When you calculate the amount of money latex, pouches and tying material cost, plus having to buy cutting boards, roller knives and templates... then add to that the time it takes to get everything out, set it up and make bands yourself and then if you make a mistake, the waste... well, most people will find it actually works out better to simply buy the pre-made bandsets and enjoy shooting instead of the hassle of having to do it yourself. Now a little about these bandsets.... YES, they are made in China... but they're made from "Precise" brand latex, engineered specifically for slingshot use, instead of repurposed exercise bands, these are arguably the highest/best grade latex based bands you can get anywhere.... Far more UV and ozone resistant than our normal bands, these bandsets are also much better for shooting in varying temperatures as well. In fact we've measured the FPS on 95 degree days and compared it to days where the temperature only reached into the upper 30s and there's no more than 10 fps difference... which is far different than you get with medical grade latex or even Theraband. What's more is, these bandsets are all die cut and use microfiber leather pouches, so they are extremely consistent from one to the next to next. These bandsets are also all tapered for greater efficiency (20mm at the wider end tapering to 12mm and are 25cm long). The thicker the bandset, the more powerful, greater draw weight it has... the 0.75mm thick will propel a 3/8" steel ball at well over 200 fps at a standard adult draw length (about 32 inches)... whereas at the same draw length the 0.55mm thick will propel the same 3/8" steel ball at around 180 fps... But, the 0.55mm thick is better and a lot easier for use with a child's grip strength. So think of it that way... the 0.55 is more suited for a child's strength and the 0.75mm is more suited to an adult's strength potential... although the adult could use both or either for target shooting. Now it's time to 'fess up a bit... 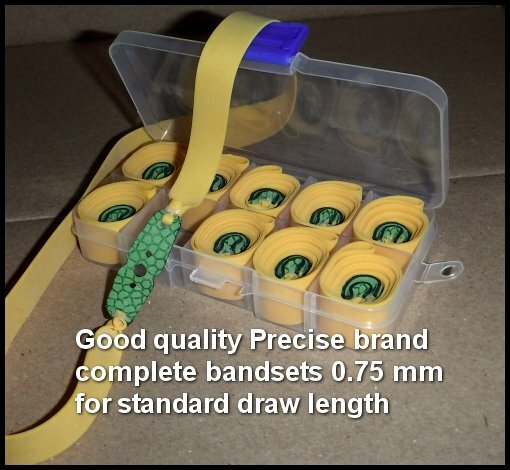 These are the same type and brand bands used by us, ourselves, for daily shooting practice (we're human too, and like to shoot more and make bands less) and since they ARE so inexpensive and convenient to use... well why not??? and in point of fact and since we're confessing anyway... the .75mm thick is what Bill used to win the 2018 SEST with, Daranda used the the .7mm, Ben and Heather used the .55mm... So yeah, now you really can use EXACTLY what we're using and they're definitely been competition tested as well! Single - nine bandsets come in a bag, but if you buy in sets of 10, they come in a really neat reuseable carrying box, as shown in the pictures. Specialty and heavier duty bandsets that we make. These are available in either Black or Gold Theraband. The black is more stretchy a little faster contracting but is about half the strength of gold. Gold is good for shooting heavy ammo at good velocities and black is better at shooting light ammo at higher velocities. Note we roll the ends in at the pouch connection for increased longevity. Also, all bandsets that WE make come with a set of smart ties included. 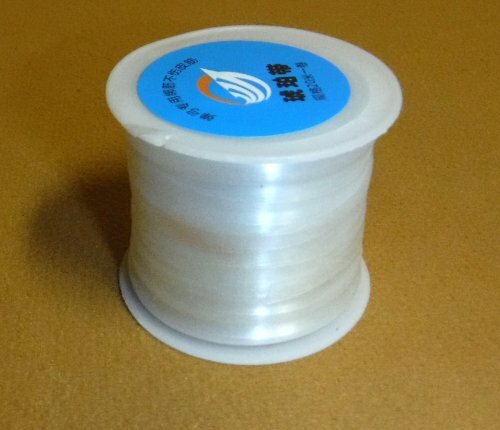 Nylon reinforced band tying tape! 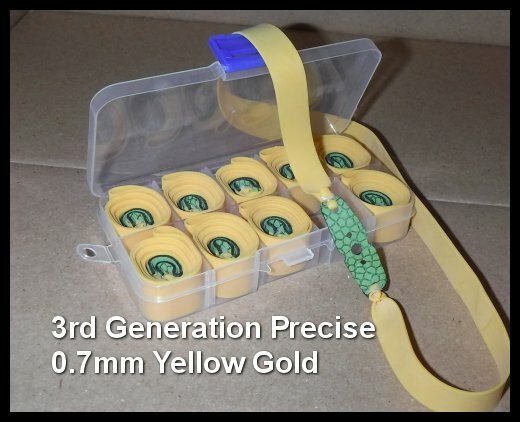 If you're finding wrap and tuck and or smart ties just a little to fiddly and hard to do... Or if your slingshot is simply shaped in such a way that band tying is just difficult to do (like a round end to tie on), OR if you simply want your slingshot to have a cleaner, more professional look... Then this is the solution to your problem! Simply cut off a short strip, ( 4 - 6 inches), position your band how you want it... and wrap the tie tape around it a few times. The tape is strong and sticks well to itself... So you'll be making nice looking setups in no time! Hey, bandsets wear out... but usually you CAN use them again! Since almost every bandset deteriorates at the pouch end... all you have to do is simply snip off right where it tore, and then retie. If done correctly, you can probably get three to five uses per bandset that way! So, like it says in the title... use this stuff to tie your pouches to your latex bands... it's lighter and thinner than tubing or rubber bands, but still plenty strong enough to get the job done... the major benefits being that it doesn't cost much and because it's light, weight is reduced "by ever so much", and every little bit counts! 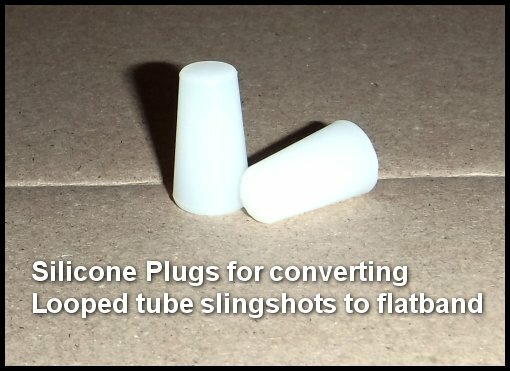 Use these to convert your "big eared" rod frame loop tube shooting slingshot into a flatband shooter! The best way to tie on your bands. Period! The simplest, most secure NO TOOL tie on method you can use on any slingshot... these are made from premium dipped latex and a nylon stick piece, each pair should last through being used on at least several new bandsets, if not more... and just so you know, all new bandsets (that we make) come with a set of Smart Ties. Check out the video on how to use! 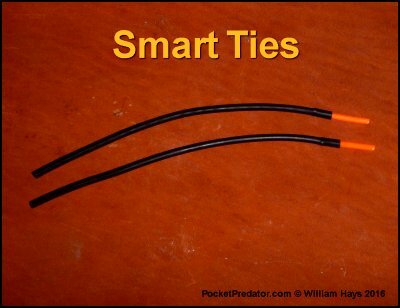 If you have a difficult time attaching bands with our "Smart Ties", then this system will probably be the thing for you. 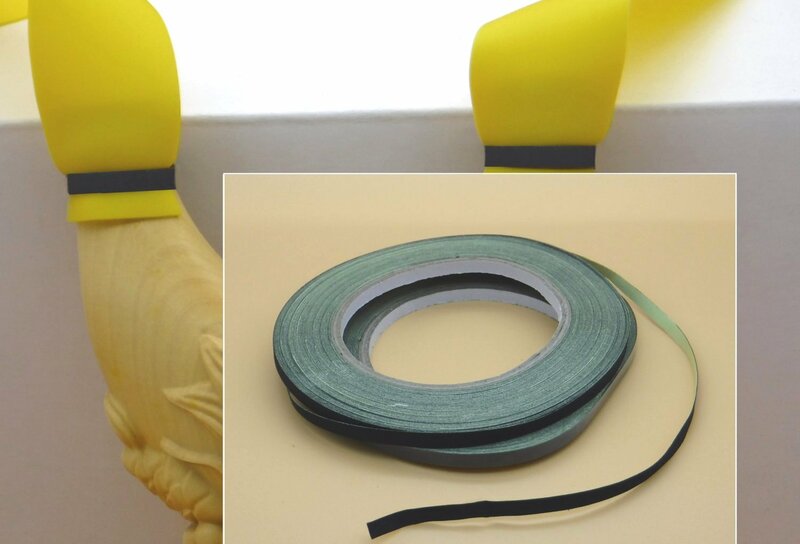 You won't have to rely on a tiny, maybe 1/8" piece of the band end, hoping it's secure after tightening down a plastic or metal compression clamp with a screwdriver... instead you can use a far safer and more sensible approach, looping the latex band through a custom made titanium buckle, tightening, and then letting it pull against itself! We don't believe in "over-kill" when it comes to safety... 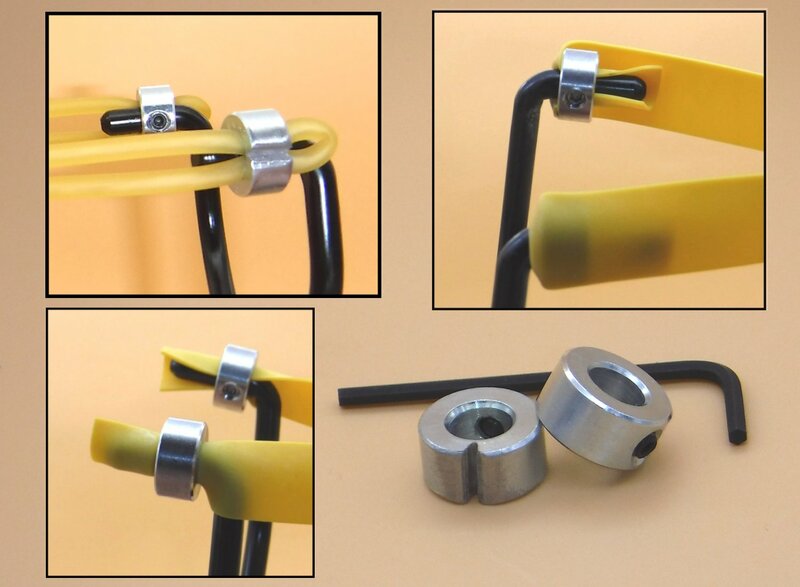 So our system utilizes a titanium buckle clamp to secure the bands to the forks... Yes, only the highest quality you can get, it's literally a TITANIUM faceplate that we have custom made for this purpose and select top quality hardware to secure the bands to the frame. 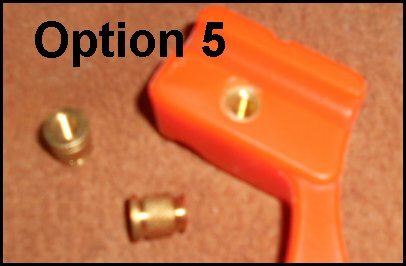 With this and if you use the thumbnut or thumbscrew options, you don't need to carry a screwdriver just so you can tighten or loosen a plastic compression clamp or metal sideplate to change out your bands or tubes.... 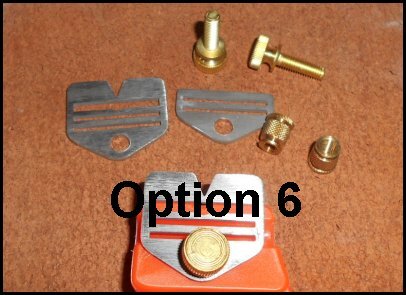 But we do offer that option as well, just in case you want a flatter form, or in the case your fingers lack the strength and or dexterity to hand tighten. Another feature of this design is it allows for infinite adjustability so a person can customize their bandset to exactly the right feel. No need to cut and waste material... whether you shoot with an anchor point or just pull back to where it feels right, you can start with the bands having a long slack length and then cinch them up, adjusting the pull weight and length to your comfort and power needs... then if you think you've cinched it up maybe a little to much.. you can simply let a little out again. 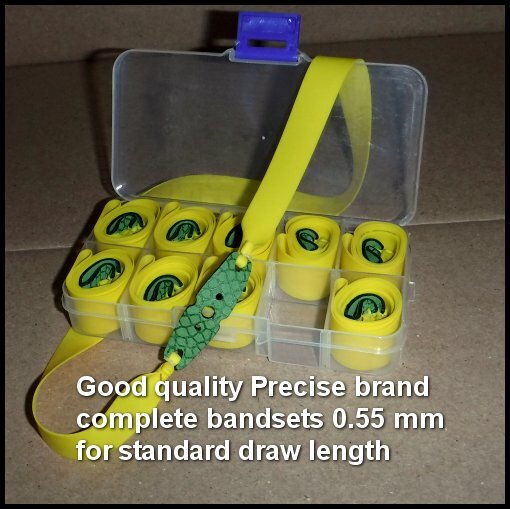 This feature is also good for those who like to reuse band material... simply mount longer than needed bands, cinch up to your desired pull... and then when your bands start to break.. let some band out and retie the pouch. Makes it easy to conserve rubber in an away from home situation. There are eight options available. 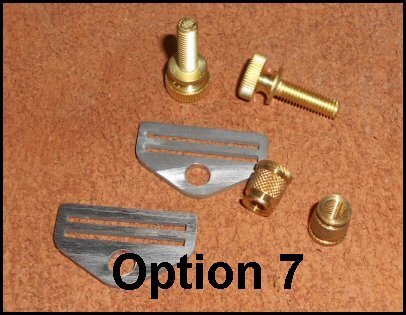 Option #1 is a pair of the titanium faceplates, a pair of stainless steel internal mount rivet type nuts, and a pair of either black anodized 6061 aircraft thumbscrews or brass, depending on which we have on hand. This will fit 1/2" - 3/4" thick frames and is the most convenient of the three for most people. Snug hole size required for the rivet nut is 19/64", which means it can fit 5/16" (20/64")- 3/8" holes as well. 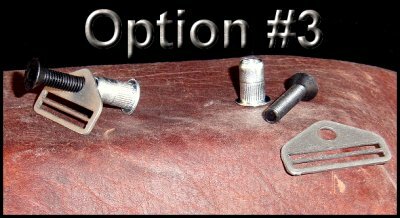 Option #2 , the pair of titanium faceplates, a pair of 1" long 10-32 UNF flat head stainless steel screws black oxidized or shiny, and two 10-32 stainless steel or brass knurled thumb nuts. This one fits up to 3/4" thick frames. For considerably thinner frames it may be necessary to shorten the screw for aesthetic purposes. 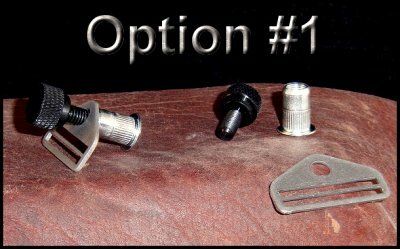 Option #3 is the titanium faceplates, a pair of 1" long flat head stainless screws (black or shiny), and two stainless rivet nuts for internal mounting. 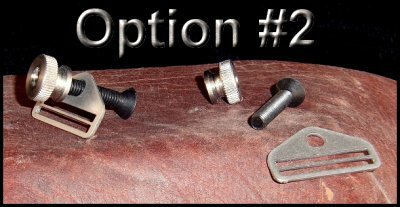 Unlike the other two options, this one does require a hex driver to loosen or tighten... 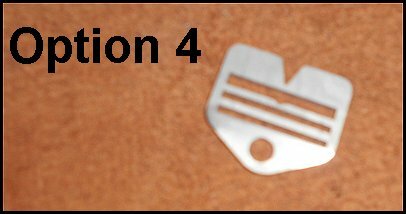 But since the screw is flat headed and the rivet is internal, it is also the lowest profile. This setup will fit frames that are 1/2" - 1" thick. 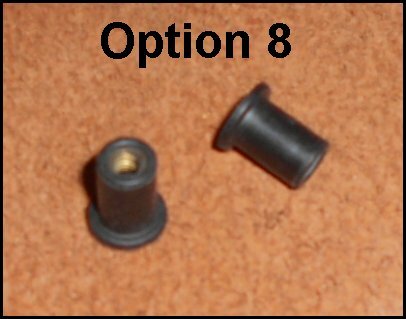 Option #8 , two 8-32 well nuts that fit the 5/16" holes on the slingshot forktips. The titanium faceplate measures 1.22" wide X 0.68" tall. It's slots are 1.05" wide X 0.08 tall. The hole is designed for a 10-32 sized screw. In pull strain testing, 100 lbs. was suspended from a single faceplate without making it unuseful for it's intended purpose. So long as the slingshot has a large enough area for the faceplate to abut, and the material the slingshot is made from can be safely drilled without giving up structural integrity/stability, this will most likely be an excellent attachment system for you. 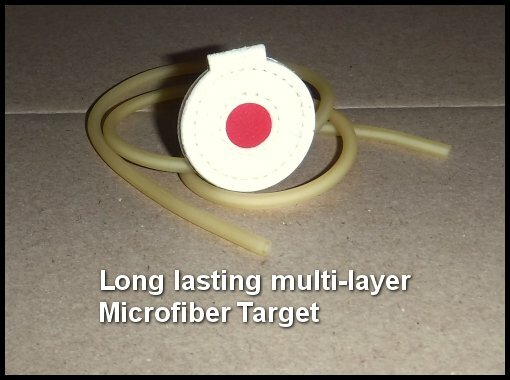 The original Hathcock Target Sniper in ballistic resin is not recommended to use this attachment system. There is a steel reinforcement directly under where the hole would need to be drilled. By drilling through that it very well could adversely affect the overall structural integrity of the fork tip. 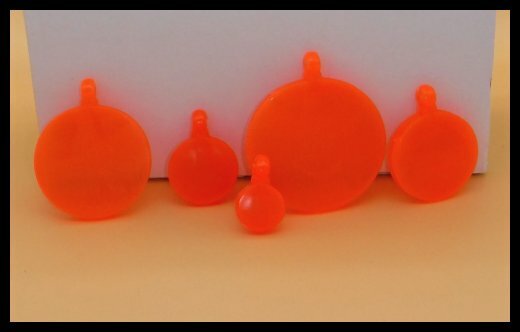 all the polycarbonate slingshots that have a Universal Fork, and all the G10 models other than the TTF only BoyScout models. As always, use good common sense before drilling into any slingshot... "measure twice and drill once". Yes, I know there's a goofy little rubber patch sewed to the front... but cut the threads (takes about a minute in total) and take the patch off, and you've got yourself a real nice looking bag to keep your ammo in. 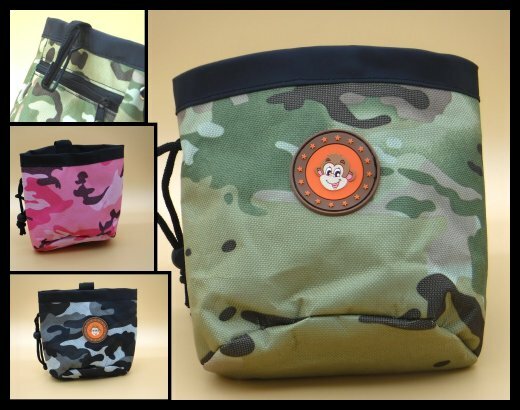 The pouches are "dump" style with a cord closure. Size is, 6.5" wide X 6" tall, big enough so you can put your hand inside, can hold an entire day's worth of ammo. The back side has another small pocket for a cell phone or something about that size and has a pocket or belt clip on a strap for free hanging and not dumping it's contents when you bend over. Pretty close to the niftiest keychain tool you can find! When we were at the last SEST (South East Slingshot Tournament), I desparately needed a screwdriver to adjust a slingshot... couldn't find one anywhere, and then a friend let me use the screwdriver device on his keychain... it wasn't as good as this one, and it wasn't able to get the screw as tight as I wanted... but it did well enough in pinch to get the job done temporarily. Unlike others, these have rounded grip edges for comfortable use with even larger hands... tight and strong hinges so it doesn't just accidently come open when attached to your keys... and it's small for easy carry and light enough to not be a strain on your ignition switch while driving..
We did the searching and trying, now all you have to do is add it to your cart! 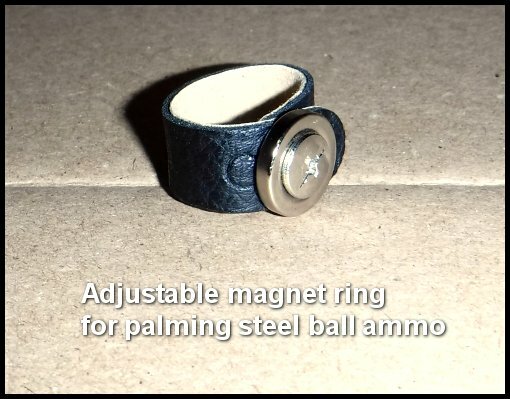 Adjustable, microfiber leather with nice magnet and stainless screw rivet... Can hold plenty of ammo for all sorts of speed shooting and trick shots! Triple layer microfiber leather, very strong, weather resistant, excellent visability day or night... pretty close to the perfect general purpose target. These generally last for about 6 months in our catch box, withstanding thousands of shots and harsh Texas weather... but if you hang them on rubber instead of wire, I'm sure they'll last even longer! 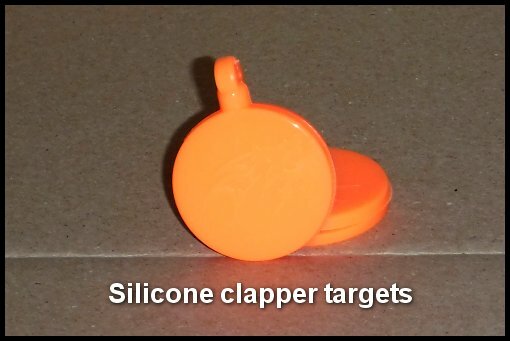 Bifurcated Clapper style Silicone Targets.... very good for wet weather climates, very stable, highly impact resistant... but after months of direct exposure to sunlight, wind and weather, they will fade in color.. of course then you can do what we do, paint them, or simply buy a new one! Hang them up, and shoot them in order.... 20mm, 30mm, 40mm, 50mm and 60mm... If you can hit them all without missing, then you're a pretty good shot! 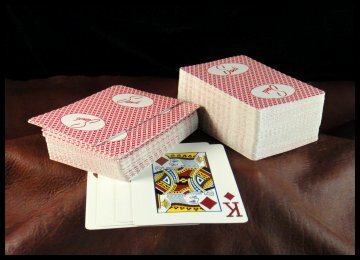 These are used casino cards... and we sell them by the inch. There are about 75 cards per inch... at only $1.50 per inch you get a lot of targets to increase your focus and precision for not much coin! These are pretty self explanatory... They fit a variety of metal rod type slingshots and will convert most into a slingbow in a matter of seconds! So, if you don't want to spend $300.00 on an obnoxiously big slingbow, or $150.00 on some other version.. but you still want to shoot arrows with a slingshot, and do it just as well, or even better than anything out there... then all you need is a cheap "Walmart" special (Daisy brand is cheap and very good for this purpose), a little paracord or similar string... Some arrows and about a minute or so to put it all together... and you're all set for slingbow shooting and hunting with a unit that's equal to if not better the most expensive and "best" out there! 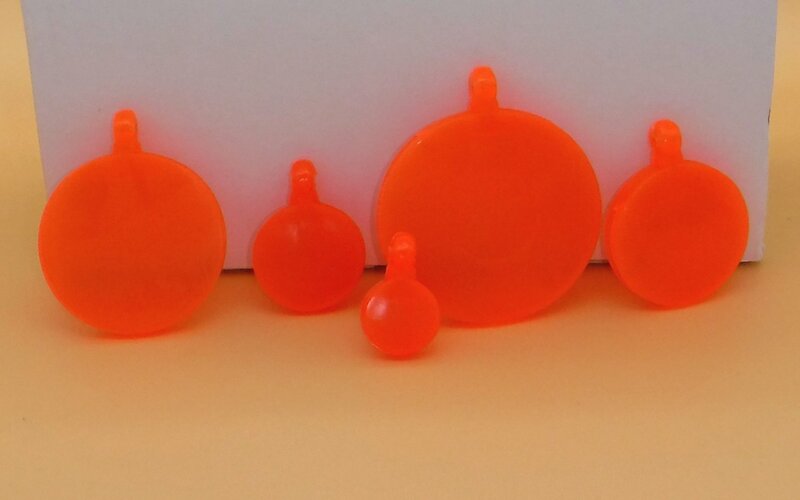 Included are two plates (to suit different nock orientations), made from solid ballistic grade polycarbonate. How to use the Archery Plates! Flashlight, attachment, battery and recharger.. for "Night Stalking"! We got a good deal on some good quality Chinese flashlights and rechargable battery setups... so we're passing along the saving to you! Simplicity is good and this one is pretty self explanatory... the very bright flashlight is a perfect hunting light because it simply turns on and off and is focusable. There's no annoying dim or blinking settings to cycle through. It comes with a powerful AA sized 14500 series battery running at 3.7 volts and it also includes the charger... so you can save on having to replace batteries in the future. Since the flashlight is easily and intuitively able to be focused near and far, you will be able to clearly see targets any where from only a few feet away all the way out to the end of your slingshot's range. 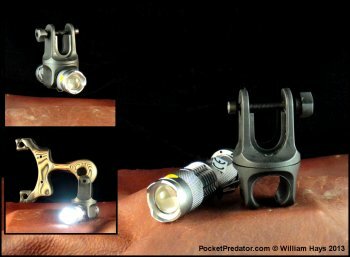 The fully adjustable flashlight attachment part can take any 1" diameter flashlight and quickly attaches to the lanyard hole... so it's able to turn pretty much any slingshot into a "NightStalker"! With it's ability to turn 360 degrees and being adjustable for many angles via the attachment point as well, and the fact that it acts as a very effective stabilizer... we might have to rename this one the "NightSniper" instead! *There are two styles of attachments... one has straight sides on the piece just adjacent to where it attaches to the lanyard, and the other style is curved... They both function exactly the same and the style that will come to you depends on which one the supplier sends us... as it's fairly random! Slingshots and slingshot shooting is dangerous. About the safest thing you can do with a slingshot is to leave it unbanded, store it in your closet, occasionally take it out to admire it and then put it back up. Rule number one, make sure you're an adult or you are using the slingshot only under close adult supervision. All the same safety rules that are commonly associated with the use of a firearm are applicable. Rule number two, ALWAYS check your band set, pouch and connections to make sure they are all in perfect working order. If there is even the smallest imperfection change out your band set to one that has no cuts, tears, holes or other problems. Then stress check your attachments to make sure there is no slippage or other undesired movement. Rule number three, ALWAYS wear safety glasses. Slingshots use rubber and or natural latex compounds... Due to naturally occurring variances, there are NO guarantees either specified or implied about how long a band set will last before failure... no one can tell you how long a band set will last before it breaks... and they ALL fail at some point. SO always be safe, if you're going to shoot with a slingshot, wear safety glasses and always check your band sets and attachments before EVERY shot. If it is not perfect, put a new one on. Rule number four, NEVER aim your slingshot at someone or something that you do not want killed or destroyed. Slingshots are capable of inflicting serious injury or even death with even the "lightest" of band and ammo setups. Treat slingshots the same way you would treat a loaded gun. Rule number five, before EVERY shot make sure there is no damage to your slingshot itself. If there is any damage including but not limited to: cracks, dents, scrapes, breaks, or any other signs of damage, DO NOT use the slingshot without thorough testing being done by a competent professional first... and even after testing always use the slingshot in a cautious manner. Rule number six, you are shooting at your own risk. We already recommended the safest course of action is to keep the slingshot on a shelf in your closet and to never use it... if you do decide to shoot even after we recommend differently... then refer to rules number 1 - 5 as reference for a possible safer way to accomplish that.